We’re all asked to justify costs at every turn so it’s no surprise that Data Centre (DC) energy managers have to make sure that every single penny counts when purchasing a monitoring and control system. We at 4NG feel that pain and have incorporated that ethos into the heart of SMARTset. We don’t want to say to a potential client “…you have to rip out all that stuff and replace it with new stuff…” just to read Power Distribution Units (PDU). So we don’t. We try and fit in with whatever a client has already invested in. It means making sure that the software can handle common industrial protocols out-of-the-box. For any protocols that are not supported, having a way in which the client can add them themselves. 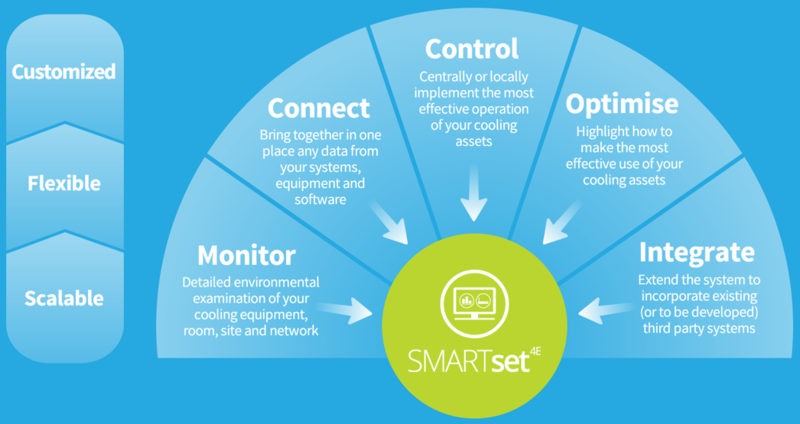 SMARTset currently supports BACnet, Modbus, SNMP, RF-Code, XML, Nest, IEC61850 and of course our own proprietary wired and wireless protocols for 4NG’s range of sensors and actuators. Clients can add more protocols using our ‘Plugin-in’ system: a programmer access point enabling clients to add features, protocols and APIs to SMARTset without having to shut down the system. It also means maintaining and growing an understanding of the physical constraints of the more exotic connectivity solutions found in the wild. Our electricians are skilled at connecting even the most awkward of serial systems to our IP based end-points using protocol converters from both 4NG and third-parties. An example being setting up multi-masters in Modbus serial networks so that we fit in seamlessly and transparently with existing BMS systems like Trend. This understanding goes deeper. Most incumbent systems will have interesting ways in which machinery is controlled from phasing of chillers right down to something as mundane as locking/unlocking rack doors. SMARTset makes it easy for the end user to replicate these ‘sequences’ so that what might have taken several steps before, is aggregated into a single action from a dashboard. The DC world is moving at pace to Internet of Things (IoT) with commoditised hardware and we are harnessing all that is good in this domain to create cost effective solutions.